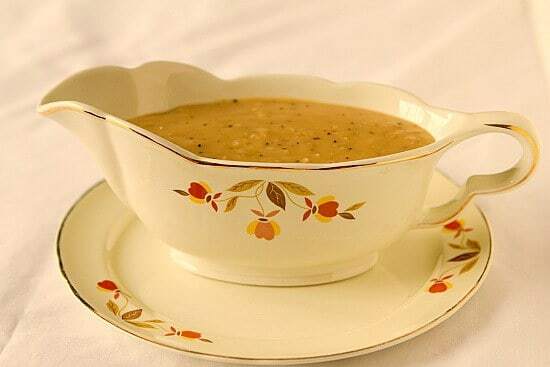 Gravy is one of my favorite components of Thanksgiving dinner. I like to drown my turkey, mashed potatoes, stuffing, and countless other things in its decadence. And then of course I use my dinner roll (more accurately, my 2nd or 3rd dinner roll) to soak up any leftover gravy and bits of food on my plate. (Quick aside – I do this all the time, use bread to wipe/soak up any remnants on my plate. I’ve been told by others it’s an Italian thing. True?) Okay, back to gravy. LOVE gravy, but hate making it with drippings. With everything else going on as soon as the turkey comes out of the oven, I feel like getting the gravy finished unnecessarily heightens Thanksgiving stress levels worldwide. 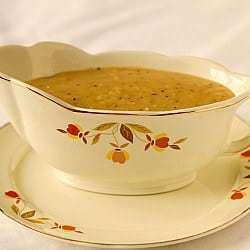 Enter this awesome recipe for a thick, creamy and flavorful gravy but without having to wait for the turkey to come out of the oven. It’s another recipe I discovered last Thanksgiving, and now it’s a staple. You can go about this two ways: (1) If you are resourceful and you used the scraps from last year’s turkey to make homemade turkey stock and have it stashed away in the freezer, you can definitely put that to use here. (2) If you’re like me and don’t want to do one more ounce of work after the table is cleared (a.k.a. 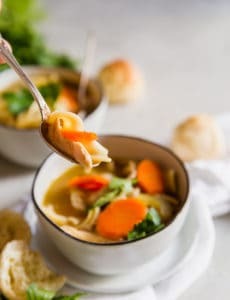 you didn’t make homemade stock last year), you can buy turkey or chicken stock from the store for this recipe. 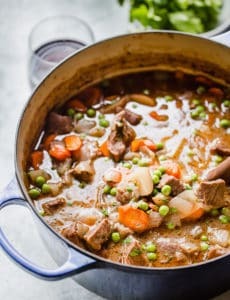 Since the stock is ready, you can go ahead and whisk together this gravy right before serving the meal or (my preference) make it the day before, let it cool, refrigerate it, and then warm it up in a saucepan when you’re ready to serve dinner. (You may have to drizzle in a little extra stock to thin it out if it got too thick in the fridge.) Additionally, you could make it even further in advance, say this week, and instead of refrigerating it, put it in a freezer-safe bag or container and freeze. Take it out of the freezer and put it in the refrigerator the day before Thanksgiving, and then proceed with the heating up/thinning out as I mentioned above. I LOVE gravy, but I don’t love the headache and stress of whipping it up while everyone is waiting to eat. 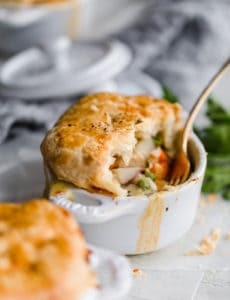 This recipe is the perfect solution, and did I mention delicious?? Perfectly seasoned and a great accompaniment to the turkey and all the trimmings. One year ago: What Are You Thankful For? Hello Michelle, i just made turkey stock (saw online video/recipe from “Chef John” on how to do this but my question is, I have 2 tablespoons of the fat from the gravy when I used the separator. In his video, he said to save 2 tablespoons of fat that was skimmed off the top while simmering. to make the gravy. Well, I will use your recipe next week but we don’t usually use the fat because of the gravy separator. Do you use the fat, any of it, t or not???? Maybe not??? It probably is more flavorful but ??? Thanks! Hi Kathy, I never have! So glad I had this gravy recipe; just made it for tomorrow’s Thanksgiving dinner. Will refrigerate and add some potato water to thin out tomorrow when I head it up. It’s really, really good but I did not have cognac or brandy so just added some half & half. Didn’t add as much salt & was still great. So glad to have this made ahead of time. I cooked the onions slowly till browned so that took a little while. Thanks for all your great recipes! 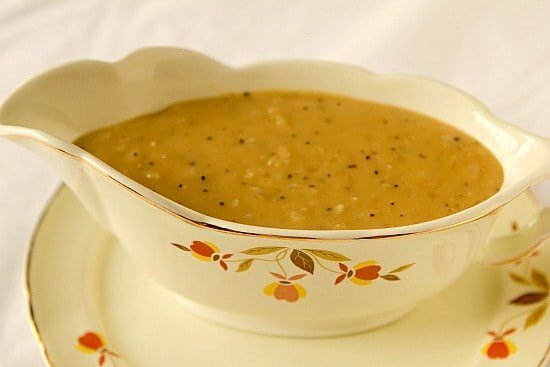 I am not a “successful” gravy maker! That said, this gravy sounds like the best idea…ever!! The last couple Thanksgivings, I have been making the gravy and putting it in a small 1-1/2 qt. slow cooker. Keep it on warm, and it is perfect for as long as you need it. To print the recipe, the ad covers most of the page. How can the ad be removed? help. Hi Kay, When I use the print function, there is no ad? wow! I made this today for Thanksgiving dinner tomorrow and it does not disappoint! I’ve never been a fan of gravy, but I was licking the spoon when I was finished. Thanks for sharing! Gonna try your gravy recipe for Christmas this year! I made this for Thanksgiving & everyone raved about it. I’d like to make some to have in the freezer now. Sorry if I missed this somewhere – but how long can you freeze this for? Thanks so much! Hi Robyn, I would say 2 months. Enjoy! What brand of stock do you buy? Hi Sara, I buy the store brand’s “gourmet” option, which is 100% natural. Is there such a thing as a nondairy sub for heavy cream? We have 2 lactose intolerant guests. Unfortunately, I’m not aware of a nondairy substitute for heavy cream. Thanks for this recipe. It’s my first time making a thanksgiving meal by myself and i’m glad to have some stress put off of me. Do not use Jack Daniels new honey-flavored whisky if you plan to follow the rest of the recipe exactly. It will taste… not very good. My mistake. I should have skipped the alcohol entirely, or used brandy or bourbon. The honey flavoring in the JD is just too overwhelming. However. I was reluctant to throw out/start over with the gravy, so I had to think fast. I added about 2 tbsp garlic powder and a LOT of turkey drippings (from the roasting pan), and while the honey flavoring was still very strong, it tasted MUCH better. There were even many requests for gravy after there was no more gravy to be given, so that’s a good sign. My husband didn’t care for it, but he’s picky.